Official sites of the nine Provinces, their capital cities as well as tourist guides, newspapers and other information. 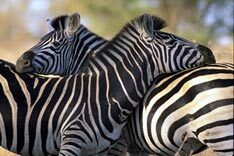 Destination South Africa, this page invites you to a virtual travel to the 9 provinces of South Africa. Here you will find comprehensive information about all the provinces' geography, economy, people, culture, environment, government and history. You will have access to newspapers from South African provinces and you will find travel and tourism information. Tourism South Africa, official site of the South Africa Tourism Board. Mangaung Local Municipality; (the city's name in seSotho is Mangaung). Detailed Map of South Africa. South Africa's Provinces Map (click to enlarge). The Eastern Cape is located on the south eastern seaboard of South Africa and is the second largest province with an area of 170 600 sq. km, home to 6 300 000 people more than 80% of them speak IsiXhosa. Information about and a searchable map and satellite view of Port Elizabeth. One of Africa's largest and most colorful cultural event. The only South African university situated in a nature reserve, founded 1964. Official site of the Free State Administration. Independent Online's Free State news. Tourism in the Free State. Provides information on Free State. With over 17 000 sq km the smallest of the nine provinces. In the seSotho languages 'Gauteng' means 'Place of Gold'. The official City of Johannesburg website. Independent daily newspaper, first published in 1898, Pretoria. Gauteng guide by the Gauteng Tourism Authority. University of Pretoria, founded in 1908. Gauteng Site about amazing finds that have led leading palaeo-anthropologists and archaeologists to suggest that humankind first appeared in this corner of Africa and from there spread out to populate the world. The garden province, home of the Zulu nation, situated south of Mpumalanga province in the southeast of South Africa, bordering the Indian Ocean, Mozambique, Swaziland, and Lesotho. eThekwini Municipality, the official web site of Durban. A guide to Pietermaritzburg and surrounding areas. Situated at the North Eastern corner of South Africa, Limpopo shares borders with Botswana, Zimbabwe and Mozambique. The former Northern Province has been renamed Limpopo Province in February 2002. Home of the Northern Sotho (SePedi) 57%, the Tsonga (Shangaan) 23%, and the Venda 12%. Afrikaans speakers make up 2.6 per cent while English-speaking whites are less than half a per cent. 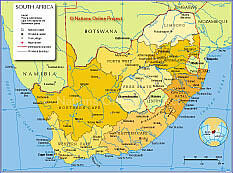 The site also provides information about Limpopo Province. Provides some general information about Limpopo. Mpumalanga lies in the east of South Africa, north of KwaZulu-Natal bordering Swaziland and Mozambique. The Mpumalanga Provincial Government Website. Mpumalanga and South African news. The official provincial website providing Tourist Information on Mpumalanga. Mpumalanga Explorer provides some information about the province and Kruger National Park. Situated in the north-western part of South Africa, the Northern Cape is the largest province of the nine provinces, about trice the size of Germany, but it's the province with the smallest population. The Province is home to 840 000 people, most of them speak Afrikaans, about 70% of the population is urbanised. A guide to Namaqualand, Green Kalahari, Kalahari, the Diamond Fields and more. The Province in the north of South Africa is home to 3,7 million people of whom 2,2 million live in functional urban areas. In terms of population, the largest urban area is Kleksdorp, with 423 000 people. The second largest nodal point is Potchefstroom. Official site of the North-West Province Government. Clickable search map of the North-West Province. Independent Online's North-West Province news. Tour and travel guide to the North-West Province. Parks, Game and Nature Reserves in the North-West Province. The Western Cape is situated on the south-western tip of the African continent. In total the Western Cape includes an area of 129 386 sq km. There are approximately 4.5 million people, living in the province, the majority of whom are Afrikaans-speaking. The other official languages are English and Xhosa. Official site for the City of Cape Town. Cape Gateway is a single point of access to government information and services for the citizens of the Western Cape. Clickable search map of Western Cape. Cape Town, regional Afrikaans newspaper. Daily, published since 1876, Cape Town. Official web site of the Western Cape Tourism Board. The official Cape Town Tourism site with travel, accommodation, and event details for visits to Cape Town. The Garden Route of Western Cape. Comprehensive information about the Overberg region on the Southernmost tip of Africa. Official web site of the regional tourism office for the Overberg region. A guide to Cape's West Coast. A project to empower educators to use appropriate and available technology to deliver curriculum. Established in 1959 as an ethnic college for "coloured" students, today a national university.